In the old days of Texas barbecue, you got brisket, sausage, and ribs— the end. But nowadays in Belton, a barbecue pit stop offers anything from housemade hot links and bacon-wrapped quail to sopapilla cheesecake. Miller’s Smokehouse and Schoepf’s Bar-B-Que are both taking barbecue to new frontiers, and we are the beneficiaries. At Schoepf’s, you order straight from the pits, where it’s easy for your eyes to be much bigger than your stomach. At Miller’s, make sure you save room for Momma Miller’s homemade pies and cookies. I call before I go and make sure she saves me a whole buttermilk pie for the road. Right in the heart of downtown is Texas’ oldest department store, which has been continuously operating since 1869. With everything from women’s jewelry to cowboy boots, you’ll find plenty of ways to spend your money. The second floor holds the real treasure: a museum that displays photos and antiques from the store’s 150-year history. Oh, if we could go back to the days of $1 blue jeans. Housed in the historic 1904 Carnegie Library, this museum holds a collection of Texas relics such as the necklace found in Santa Anna’s pocket when he was captured at San Jacinto. One exhibit highlights the nearby Gault site, where archeologists have discovered the oldest evidence of humans in North America. 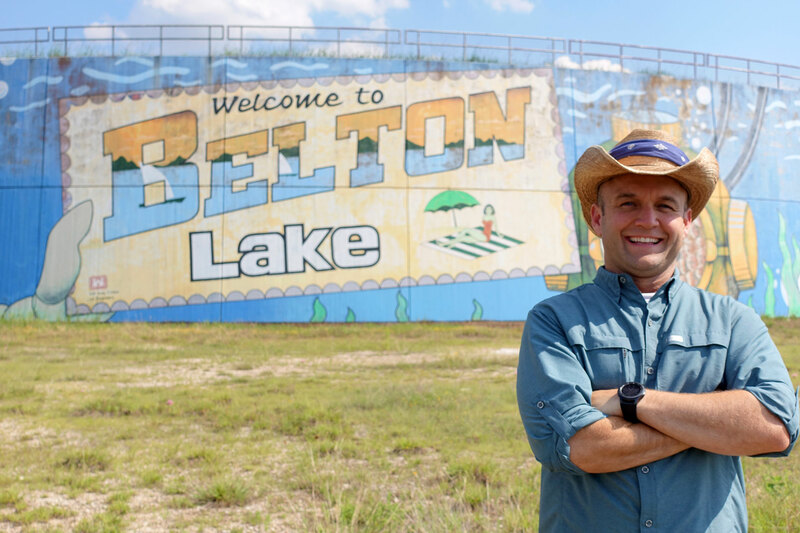 The name may be confusing, but it’s really just shorthand for “Lake Fun” (or officially, Belton Lake Outdoor Recreation Area). Though it’s inside the Fort Hood military base, the public gets access to the best beaches of Belton Lake. There’s a climbing wall, equestrian trails, and cabins for rent, but my favorite thing to do is bring my mountain bike and disappear into the hilly thicket on some of the best unknown trails in Central Texas. Nolan Creek flows just south of the county courthouse, and when the flow is good and the sun is out, the creek makes for a great way to cool off. It also sets the perfect backdrop for a meal in this converted 1920s cotton gin serving elevated country classics. Order a crispy fried pork chop and end the day watching the sun go down. To view the Route 66 episode visit thedaytripper.com. Follow along on Facebook, Instagram, and Twitter.